Copyright © 2013 Ismat Aldmour. This is an open access article distributed under the Creative Commons Attribution License, which permits unrestricted use, distribution, and reproduction in any medium, provided the original work is properly cited. Two wireless technologies, WiMAX based on IEEE standards and LTE standardized by 3GPP, are two competing technologies, nevertheless, are very technically similar. This competition started with the advent of their pre-4G versions (802.16e for Mobile WiMAX and 3GPP release 8 for LTE) and continued with the advent of their 4G versions (WiMAX 2.0 based on IEEE 802.16 m and LTE-Advanced standardized by Release 10). It looks that the competition ended with the advantage of LTE. Plans are set for WiMAX to migrate/integrate with LTE in a multiple heterogeneous access technology mode. This article addresses the technical similarities and differences that advantage one technology over the other technology in order to determine which of these factors might have contributed to LTE winning. Nontechnical factors of commercial and historical nature which might also advantage one technology over the other one are also explored. Finally, current activities in the standardization of both WiMAX and LTE are presented with a perspective on the prospects of both technologies. WiMAX (Worldwide Interoperability for Microwave Access); is a technology standardized by IEEE. IEEE issued a series of standards, IEEE 802.16 series of standards, starting 2000, which aimed to provide a metropolitan area data access called Wireless MAN standards. The first in the series that found real applicability was IEEE 802.16d in 2004 . This standard aimed to provide high throughput wireless data, last-mile broadband, to fixed users, which formed a real competitor to DSL and cable data providers. IEEE 802.16e in 2005  formed the basis to what is known as Mobile WiMAX, or WiMAX R1.0. Lately, IEEE 802.16m, standardized in March, 2011, was considered for WiMAX Release 2.0. Release 2.0 offers many folds higher data rates than Release 1.0 and was lately officially recognized as 4G in 2012 . 4G technologies shall satisfy the IMT-Advanced of the ITU  aiming at peak data rates in the order of 1 Gbps for low mobility users and 100 Mbps for high mobility users on the downlink to support advanced services and applications . On the other hand, LTE (Long Term Evolution), a mobile telecommunication technology standardized by 3GPP, is the biggest jump on the evolution path from 3G UMTS and CDMA2000 towards 4G, with ambitious requirements for data rates, capacity and latencies . An advanced version of LTE, LTE-Advanced based on 3GPP UMTS Rel 10 in 2011, is also a 4G recognized mobile technology . The two technologies, WiMAX and LTE, competed with each other starting their pre-4G versions and continued with their 4G versions while having much in common. It looks like that finally WiMAX gave up the competition and selected to harmonize and integrate with LTE in its future harmonized WiMAX advanced standard supporting multiple access technologies. This work addresses the technical similarities and differences between the two technologies trying to pinpoint those differences that advantage one technology over the other one. Other factors, commercial, historical, political, etc. which might advantage one technology over the other technology are also exploited. Finally, the article reviews plans of WiMAX and LTE future with alternatives to WiMAX discussed. 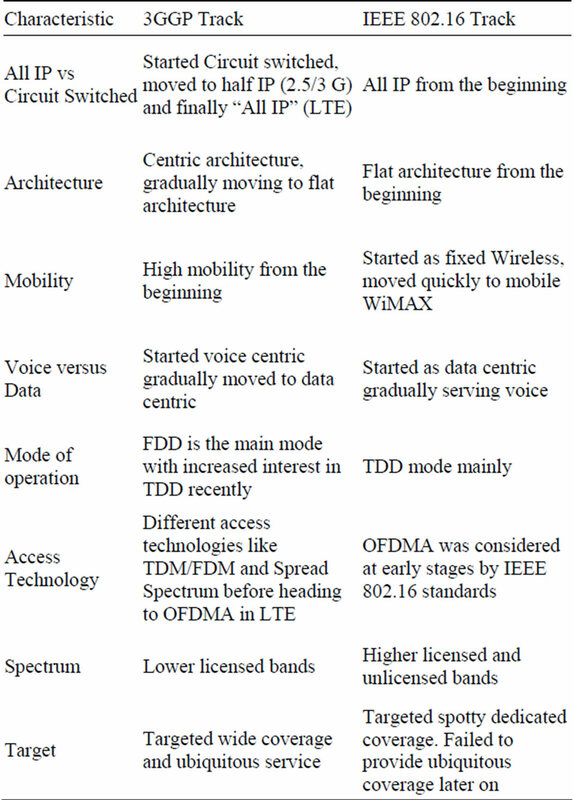 The rest of the paper is organized as follows: Section 2 presents the evolution of both LTE and WiMAX standards. Section 3 presents salient features of both. Section 4 discusses some of the main technical differences between the two technologies, while Section 5 discusses other non-technical factors that favor one or the other technology. Section 6 discusses the future of both technologies followed by the conclusions in Section 7. Figure 1 below shows the evolution paths of LTE and WiMAX technologies. LTE originated from the growth path of 1G, 2G, 3G mobile generations of the telecom companies and their 3GPP and 3GPP2 associations. 1G is characterized as being analogue with systems standardized by companies like TACS in Europe and AMPS in North America. 2G systems of GSM and cdma-one came as digital solution with circuit switched voice capacity as objective. Moderate data rates were enabled using 2.5G packet switched enhancements like GPRS and EDGE while voice remained circuit switched. The IMT-2000 initiative of the ITU put the requirements for 3G systems with video and data as targets. WCDMA was the adopted system of 3GPP in Europe and many other parts of the world. CDMA2000 was the 3G system of North America (NA). Both of these two used a pair of separate frequency bands to transmit and receive in what is called Frequency Division Duplex (FDD) mode. A third 3G system adopted in China called the synchronous CDMA (SCDMA) uses a single band on Time Division Duplex (TDD) basis. 3G systems continued as both circuit and packet switched based. They received a number of enhancements enabling higher data rates such as High Speed Packet Access (HSPA) enhancement of WCDMA. The NA’s counterpart, CDMA2000, received similar enhancements as well. The advent of OFDM based all IP LTE in 3GPP release 8 with TDD and FDD modes seemed to incite migration of NA’s systems to it targeting a unified telecom standard. Plans for Ultra Mobile Broadband (UMB); a suggested OFDM system of NA’s 3GPP2, were cancelled. Moreover, TD-SCDMA migration is planned toward TDD mode of LTE (TD-LTE). LTE is considered a 3G system but it provides many folds higher rates than the basic 3G systems. It is therefore called pre-4G or sometimes 3.9G. Commercially it is considered 4G. IMT-Advanced initiative by the ITU in 2003  set the framework and overall objectives of 4G systems and accelerated the work toward these systems by setting October 2009 as a deadline date for submitting proposals. It sets an ambitious high data rate of 1.0 Gbps peak rate for fixed services and 100 Mbps for mobile services with mobility up to 500 km/hr. It also sets more requirements on packet and handover latency and VOIP efficiency. Additionally, it sets peak and average cell spectral efficiencies and spectral efficiency requirements at cell edges to ensure high throughputs all over. The advanced version of LTE, LTE-Advanced based on 3GPP UMTS Rel 10 in 2011, is an officially recognized 4G technology satisfying IMT-Advanced. On the other hand WiMAX grew out from IEEE standards adopted by data companies with deep roots in wireline technologies (e.g. the Ethernet standards of IEEE 802.3, etc.) and WiFi wireless technologies (IEEE 802.11). Early attempts to provide metropolitan wireless broad band were based on fixed wireless access techniques that require line of sight and rooftop antennas and operated at high frequencies that can be affected by rain and atmospheric conditions. These attempts had little success. The first in the series that found real applicability was IEEE 802.16d in 2004 . This standard aimed at providing high throughput wireless data, last-mile broadband, to fixed users, which formed a real competitor to DSL and cable data providers. IEEE 802.16e in 2005  formed the basis to what is known as Mobile WiMAX, or WiMAX R1.0. WiMAX was officially recognized as 3G technology in 2007  many years after the recognition of the initial 3G technologies in 2000. Lately, IEEE 802.16m, standardized in March, 2011, was considered for WiMAX Release 2.0. The aim of IEEE 802.16m is to develop an advanced air interface to meet the requirements for IMT-Advanced while being compatible with previous 802.16 standards. Release 2.0, which is the other official 4G technology, offers many folds higher data rates than Release 1.0 satisfying the IMT-Advanced of the ITU . Both LTE-Advanced and WiMAX 2.0 are not yet around. LTE-Advanced is expected to be the main one as most WiMAX operators have put plans to migrate to LTE. Nevertheless, both camps have plans for the future of their technology as shown by the rightmost part of Figure 1 (Beyond 4G/Evolved 4G/Evolved 3G). These will be discussed later in the paper. Figure 1. Growth paths for LTE and WiMAX. • Sub-channelization and permutation: In the allocated spectrum, some subcarriers are used for data while some others are used as guard bands and pilots. Data carriers and pilots are randomly allotted to different sub-channels periodically. In other words, the channels are hopping. This is similar to hopping in Wifi. However, only one channel is hopping in WiFi, while in these, all the sub-channels in the spectrum, say 30, are hopping. This results in interference averaging giving rise to less error corrections and restoring system capacity . Subcarriers are subdivided into groups and only some of these groups can be used in any cell. This is called partial usage of subcarriers (PUSC). PUSC reduces neighboring cells interference therefore improving performance. An alternative is the use of fractional frequency re-use (FFR). In FFR users in the cell close to cell centre use all the frequencies while those toward the cell boundary use frequencies different to those used toward boundaries of neighboring cells in order to reduce inter-cell interference. • Both LTE and WiMAX (The mobile version of WiMAX, i.e. WiMAX 1.0, and the later WiMAX 2.0) use a version of OFDMA called scalable OFDMA (SOFDMA). In this scheme, whenever the bandwidth allotted to service provider changes, the number of subcarriers also changes so as to keep the inter-carrier spacing fixed. Therefore, the Doppler effect on performance is kept the same for mobile users. WiMAX 16e may use any available spectrum width from 1.25 MHz to 28 MHz while LTE R8 can use 1.25, 2.5, 5, 10, 15, 20 MHz. • Both LTE and WiMAX use AMC (adaptive modulation and coding) for link adaptation. In this scheme, the connection that is currently using modulation like 16 QAM can be re-scheduled to say, QPSK, a more robust modulation whenever the user’s signal is fading, e.g. the user is moving away from base station therefore struggling with smaller signal to noise ratios. This ensures that the connection is kept at an acceptable quality thereafter increasing the range. On the other hand, an approaching user connected at say 16 QAM who is enjoying improved signal to noise ratio can be switched to a higher order modulation like 64 QAM which can provide higher bps/Hz, thereafter increasing capacity. AMC when combined with multicarrier OFDM will result in more advantageous results. This is because adapting a narrowband channel to noise conditions is more efficient than adapting to averaged noise in a wide band channel . Other features of LTE/WiMAX are the use of Hybrid ARQ (HARQ) technique for error detection and multiple antennas to further augment performance and data rates. • Framing: WiMAX R1.0, suffered from high latencies due to its relatively long frames of 5 ms compared to the later LTE which has a subframe of 1 ms long. Therefore, WiMAX, in its new release subdivided the 5 ms frame into 8 subframes (now the subframe is 5/8 ms). They also kept the 5 ms frames for compatibility purposes with legacy WiMAX R1.0. Furthermore, a super frame of 20 ms is introduced. It aims to reduce framing overheads by incorporating the common headers and control bits in it. Thus, the new release framing structure is a 3 level framing structure. The new framing structure offers persistent allocations to insure QoS for recurring (VOIP) transmissions. Similarly, LTE has a similar 3 level framing structure with basic slot of 0.5 ms duration. 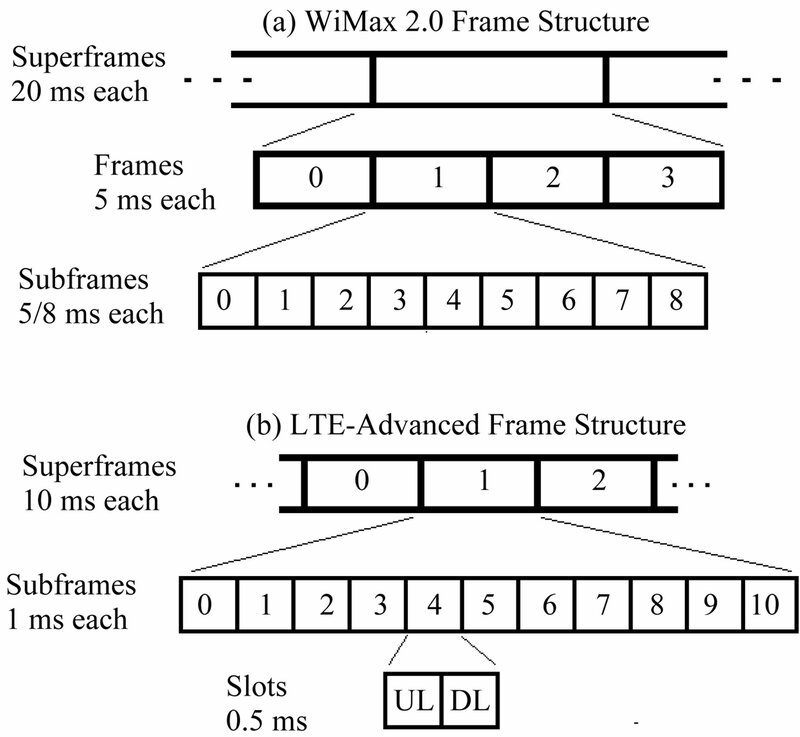 The frames structure for both LTE-Advanced and WiMAX 2.0 are shown in Figure 2. • Data rates: To attain high peak data rates requirements of IMT-advanced, LTE-Advanced and WiMAX R2.0 work on increasing the transmission bandwidth utilized up to 40/100 MHz bandwidth respectively. As it is not likely that such large bandwidths be available in one band, subcarriers are spread over multiple frequency bands. This is called multicarrier or carrier aggregation. Subcarriers in any one channel can be contiguous in the same band or selected from separate bands. • Cell edge throughputs: Besides peak data rates, IMT-Advanced concentrated on average as well as cell edge throughputs. This issue has been lightly tackled in previous systems Many of the WiMAX R2.0/LTE-Advanced specifications exceed those of IMT advanced requirements [11,12]; for example, WiMAX 2.0 shall offer a downlink spectral efficiency of 2.6 and 0.09 bit/s/Hz/sector for cell and cell edge users respectively while IMT advanced requires 2.2 and 0.06 respectively. - Self-Organizing Networks (SON) to reduce costs of operation and maintenance and optimize performance. Figure 2. Frame (a) WiMAX 2.0; (b) LTE-Advanced. telecom companies and continued throughout the different generations. TD-LTE is gaining popularity as migration path of the synchronous CDMA of China 3G. WiMAX, on the other hand, had TDD focus throughout. Future WiMAX embracing LTE will most likely head to TD-LTE. Spectrum: Legacy LTE and LTE advanced use Licensed IMT-2000 Bands at bands like 700, 900, 1800, 2100, and 2600 MHz while legacy WiMAX is Licensed & unlicensed, at 2.3, 2.5, 3.5 and 5.8 GHz. Thus LTE is generally available at preferred low frequency band which gives it coverage advantage. This enhanced its opportunities to serve as public wide area network. With WiMAX heading to LTE some operators started trying LTE in some of the WiMAX bands they already posses. Intercarrier spacing: LTE uses a standard 15 KHz intercarrier spacing while WiMAX 2.0 uses 10.94 KHz. The larger intercarrier spacing the higher the immunity against Doppler spread. LTE can handle mobility speeds up to 350 Km/hr while WiMAX can support speeds of the order of 120 Km/hr with WiMAX 2.0 up to 350 Km/hr. Access technology: LTE-Advanced access technology for its downlink (OFDMA) is different to its uplink. In the uplink Single Carrier FDMA (SC-FDMA) is used. SC-FDMA reduces Peak-to-Average-Power-Ratio (PAPR) by 3 - 5 dB giving rise to uplink improvements that can be utilized to improve coverage or throughputs of cell edge users. 802.16m uses SOFDMA for both uplink and downlink. In fact, the major problem in extending GSM TDMA and wideband CDMA to broadband systems is increased receiver complexity with multipath signal reception. The main advantage of OFDM, as is for SCFDMA, is its robustness against multipath signal propagation, which makes it suitable for broadband systems . Comparing 4G WiMAX and LTE from other aspects are covered in the literature as well. For example  compares LTE and WiMAX when used in enterprise environment from two aspects security and integration into enterprise IT network. It was found that both WiMAX and LTE can be hosted and deployed by the enterprise as the next generation of mobile enterprise network and WiMAX can meet enterprise security naturally because of the WiMAX’s authentication protocols. Generally, it can be concluded that LTE design seems to be superior especially concerning mobility, data throughputs and capacity. However, these factors, though important may not be the only factors that impact the popularity of one technology compared to the other. This is discussed in the coming section. Beside the technological constrains other regional, operator and regulatory factors and constraints, lead to the preference of LTE over WiMAX or WiMax over LTE. WiMAX proceeded LTE in appearance and deployment. WiMAX was backed in the USA by Clearwire and later Clearwire/Sprinit partnership. It was also adopted by major companies in Korea, Russia, Japan and other countries. Many other developing countries like India found WiMAX, even the non-mobile version, suitable for its broadband requirements  due to the lack of proper fixed line infrastructure. WiMAX is a TDD technology which does not require paired spectrum with flexibility in sharing the time frame between the uplink and the downlink. This made it appear more appropriate for data as the viable wireless alternative to wired DSL. On the other hand, phone companies, adopting 3GPP/3GPP2 standards of 2G, 3G and LTE use one band of frequencies for the uplink and another band for the downlink. This makes these systems more costly in terms of spectrum and equipment. However, the introduction of TD-LTE, a TDD version of LTE with single band for its operation wipes out one main advantage of WiMAX over LTE. The set of IEEE standards, on which WiMAX releases are based, are modular stand-alone standards offering high performance. The 4G version of WiMAX (WiMAX 2.0) have no support for legacy 3GPP devices, which means no handovers possible to and from 2G (GSM) and 3G (UMTS) etc. On the other hand, 3GPP provided a clear evolution path towards LTE for 2G and 3G standards of Europe, North America and China. LTE-Advanced is backward compatible with all previous standards. Hence, operators worldwide who have already deployed their networks based on 3GPP standards find it a good business case with easy upgrade and with possibility that they re-use their already possessed paired spectrum of abandoned technologies of 2G or so for the more efficient LTE. The 3G TD-SCDMA of China will take a home-made evolution path aiming at a smooth migration to LTEAdvanced . To save investment and make full use of the network infrastructure available, the design of TDLTE takes into account the features of TD-SCDMA, and keeps TD-LTE backward compatible with TD-SCDMA systems to ensure smooth migration. At the same time, WiMAX has limited spectrum options for deployment making it difficult for existing operators (networks based on 3GPP legacy standards) to migrate to it. LTE success is the result of being backward compatible to the abundant customer base built over the different generations. This is said though WiMAX showed superiority in early stages. Table 1 below provides a comparison of 3GPP track that led to LTE and IEEE 802.16 track that led to current WiMAX. The table shows superiority of IEEE standards as it used OFDMA, provided high data rates, all IP and flat architecture from the beginning. It managed later on to provide mobility and cater for voice servicing. On the other hand, 3GPP targeted wide coverage and ubiquitous service while at the same time gradually staffed some salient IEEE features like OFDMA, TDD, all IP, flat architecture and higher data rates which together contributed to LTE success later on. Table 1. 3GPP track and IEEE 802.16 track compared. WIMAX had the precedence advantage over LTE in bringing to light much of the themes currently adopted such as the flat architecture, all IP network and TDD structure. 3GPP on the other hand, moved from all circuit switched of 2G, through half packetized of 2.5G and 3G and finally to all IP in LTE and LTE-Advanced. The objective of telecom companies from the start was big customer base, public networks and wide coverage while WiMAX headed to serve vertical segments requesting broadband. This, together with the previously discussed factors, made WiMAX people realize that the ecosystem of WiMAX as a stand-alone technology cannot continue to compete with 3GPP stream and its attractive LTE. WiMAX forum had to set plans to proceed. One of which is to harmonize and integrate with LTE rather than continue rivaling it as is discussed below. 1) WiMAX integration with LTE and other multiple access technologies. This will keep it a mobile operator solution in a robust ecosystem. In late 2012, WiMAX forum approved requirements for WiMAX coexistence and harmonization with LTE networks . In WiMAX R2.2, expected to be finalized by the end of 2013, focus will be on coexistence of multiple radio access technologies and on features such as link aggregation and load balancing. Networks that support both standards and more multiple access technologies may emerge in 2014. 2) WiMAX technology as private network in vertical segments like utilities, aviation and similar segments which require reliable networking to manage their operations. This is called the wireless Ethernet. 3) WiMAX operators who hold TDD spectrum and built WiMAX networks will continue to grow within some of its traditional markets in Japan, Korea, Malaysia and in the USA. It is expected that it will be there for some time. There are even ongoing plans for launching WiMAX 2.0 (IEEE 802.16m) in Japan by its large WiMAX operator (UQ) and in Malaysia by YTEL. Wireless technology can be an optimal solution in environments such as the energy utilities and aviation. This provided an alternative for WiMAX; i.e. to grow in private networks serving dedicated segments. The WiGRID, is a new wide-area networking technology based on IEEE 802.16e with requirements announced early this year . It is a technology for energy utilities and smart grid industrial applications of telemetry, measurements and managements of critical systems that require realtime and high security . For such services, WiMAX shall be optimized for uplink (uplink biased) with reduced latencies and increased range . Frequency bands that various utilities hold, namely 1.4 GHz, 1.8 GHz, 2.3 GHz, 3.65 GHz and 5.8 GHz, can be utilized . Public WiMAX, LTE and other 3GPP solutions will not provide the same service with reliability due to congestions. Public cellular networks on the other hand can be used for smart metering applications because of good coverage and less requirements of realtime and security . WiMAX based private wireless system is suggested for monitoring power distribution stations. For example, in  cognitive spectrum WiMAX sharing with SCADA system in 223 - 225 MHz is suggested. The solution requires few modifications on MAC and PHY layer to support interference management . AeroMACS is another WiMAX technology to support aviation industry in airports communications infrastructure. Other similar segments of interest to WiMAX’s are transportation and oil and gas industries. Other uses of the WiMAX wireless Ethernet can be video distribution techniques for m-Health and similar applications. The migration to LTE path will necessitate lots of software and hardware upgrades to network components, core network, backhaul and devices to serve the multimode heterogeneous harmonized set of access technologies. The cost incurred can be understood if this will give the WiMAX operators, who have small customer base compared to 3GPP, access to the much larger base of 3GPP technologies, customers, and ecosystem. On the contrary it can be an opportunity for 3GPP big operators to acquire WiMAX customers. Regardless of some recent growth of WiMAX technology in certain Asian countries, its continuity will largely depend on its success in vertical markets like aviation, utility and transportation rather than on reliance on public networking. Success in harmonization with LTE means that specialized segments can be served through dedicated WiMAX networks while at the same time offering them the public service. This looks like a unique combination in which embracing the competition is elected as the approach instead of the competition approach itself. 3GPP provided a smooth path of transition of its current technologies to LTE and LTE advanced. Lots of efforts are in progress to issue new 3GPP releases in 2013 and 2014. The upcoming Release 12 and beyond will be as significant as ever in the industry’s quest to extend mobile broadband availability, provide much more consistent service quality, and economically satisfy demand for spiraling data growth in face of spectrum scarcity . • Multiplication of current peak, average, and cell edge data rates due to the factors of more bandwidth, higher order 3D-MIMO, higher order QAMs, small cells etc. • Macro cell will continue to exist as the upper layer in a multi-tier network shadowing underneath it large number of randomly distributed micro, pico, and femto cells that may run at higher frequency bands than those used in macro-cells. The resulting heterogeneous structure will be self organized with enhanced mobility between the different cell types and efficient Inter-Cell Interference Coordination (ICIC) procedures. This architecture will help in offloading high data traffic to small cells thereby increasing total throughput. It will also help lessening coverage holes and provide high traffic indoors. WLAN (WiFi) will also play an increasing role in 3GPP operator’s networks to support broadband in hotspots and indoors alongside other technologies like femto cells. • More reliance on TDD mode for LTE as a result of further enhancements in DL-UL interference management and traffic adaptation. • UL performance improvements, e.g. deployment of 8 Rx antennas at eNodeB, use of cross-polarized antennas, and higher carrier frequency, etc. • 3D MIMO and massive antenna beamforming. arrays of as many as 64 antenna elements enable additional frequency reuse within cell sectors. This paper aimed at comparing LTE with WiMAX wireless technologies. It also discusses the factors that led to LTE winning as the technology for near future public networks. The article also foresees future directions of both technologies and the alternatives that WiMAX technology has. For theses purposes, the article first reviewed the evolution of the two technologies; LTE coming from the generations path of wireless mobile phone standards and WiMAX coming from data networking industry. Mobile technology path started voice centric and progressed gradually toward data while WiMAX started with broadband data in focus on progress toward serving the voice users. Salient common features of the two technologies were also revised. The two technologies, which were competing with each other, have much in common. Both are all IP with flat architecture and similar enabling technologies. Technical differences reviewed include spectrum allocation, intercarrier spacing, frames/subframes and access technology on the uplink. Generally, the impact of each of these on the prospects of the two technologies made that LTE provides more throughputs and capacity and a better mobility. Factors that influenced the competition are not only technological. Other factors influenced the fate of the competition. The final outcome is that WiMAX people realized that it is necessary to harmonize and integrate with LTE rather than continue rivaling it. This formed the future migration strategy for WiMAX. Alternatively, WiMAX is progressing toward providing networking service to serve privately specialized segments like energy utilities, aviation and transportation. The resort of such segments on private networking of WiMAX enables avoiding the congestion that may occur in public cellular networks serving large customer base. Integration of WiMAX with LTE enables its companies to serve their specialized segments with private networks while at the same time offering them the public service. WiMAX forum is working to complete the standards that will integrate multiple WiMAX and LTE technologies. Lots of software and hardware changes/additions need to be applied to devices, base stations and core networks to enable them to operate in multimode with a possible need for backhaul capacity increase. This gives less opportunities for WiMAX to continue as public wide area network. WiMAX’s continuity will largely depend on its success in vertical markets like aviation, utility and transportation rather than on reliance on public networking. 3GPP, on the other hand, is actively progressing to enhance the capabilities of LTE and other current technologies. Two new releases, R12 and R13, are under preparation. The objectives of these updates are to improve coverage, to provide much higher stable data rates, and to meet the expected high traffic demand. A number of enhancement and new enabling technologies are suggested in order to achieve these objectives such as 3D sectorization, small cells, efficient ICIC, more TDD etc. It can be said that LTE technology will prevail as one standard in the near future for serving public networks while WiMAX has good opportunities in dedicated segments. IEEE, “IEEE Standard for Local and Metropolitan Area Networks Part 16: Air Interface for Fixed Broadband Wireless Access Systems,” IEEE Standard 802.16-2004, 2004. IEEE, “Amendment for Physical and Medium Access Control Layers for Combined Fixed and Mobile Operation in Licensed Bands,” IEEE Standard 802.16e-2005, 2006. ITU, “Framework and Overall Objectives of the Future Development of IMT-2000 and Systems beyond IMT- 2000,” ITU-R M.1645, 2003. 3GPP, “Requirements for Evolved UTRA (E-UTRA) and Evolved UTRAN (E-UTRAN) Release 7,” 3GPP TS 25.913, 2007. C. Gessner, A., Roessler and M. Kottkamp, “UMTS Long Term Evolution (LTE) Technology Introduction,” Rohde and Schwarz, Application Note, IMA111_3E, 2012. IXIA, “SC-FDMA: Single Carrier FDMA in LTE,” IXIA White Paper, November 2009. L. Yi, K. Miao and A. Liu, “A Comparative Study of WiMAX and LTE as the Next Generation Mobile Enterprise Network,” Proceedings of the 13th International Conference on Advanced Communication Technology (ICACT), Gangwon-do, South Korea, 13-16 February 2011, pp. 654-658. WiMAX Forum, “Requirements for WiMAX Coexistence with LTE Networks,” WMF-T31-132-v02, December 2012. WiMAX Forum, “WiMAX Forum System Profile Requirements for Smart Grid Applications—Requirements for WiGRID,” WMF T31-002-R010-v01, February 2013. Z. Brabec, J. Holecek and T. Hruza, “Overview of Applicability of ICT Technologies for Smart Grids,” Proceedings of 15th International Symposium on MECHATRONIKA, Prague, 5-7 December 2012, pp. 1-5. Q. Wang, J. Wang, Y. Lin, J. Tang and Z. Zhu, “Interference Management for Smart Grid Communication under Cognitive Wireless Network,” Proceedings of IEEE Third International Conference on Smart Grid Communications (SmartGridComm), Tainan, 5-8 November 2012, pp. 246- 251. S. Parkvall, E. Dahlman, A. Furuskar, Y. Jading, M. Olsson, S. Wanstedt and K. Zangi, “LTE-Advanced-Evolving LTE towards IMT-Advanced,” Proceedings of IEEE 68th Vehicular Technology Conference (VTC 2008-Fall), Calgary, 21-24 September 2008, pp. 1-5.